We hope the following information will help you understand the different types of insulation (fiberglass, cellulose, spray foam, etc.) and what your installation options are. You can also download our “Insulation 101” quick reference guide. 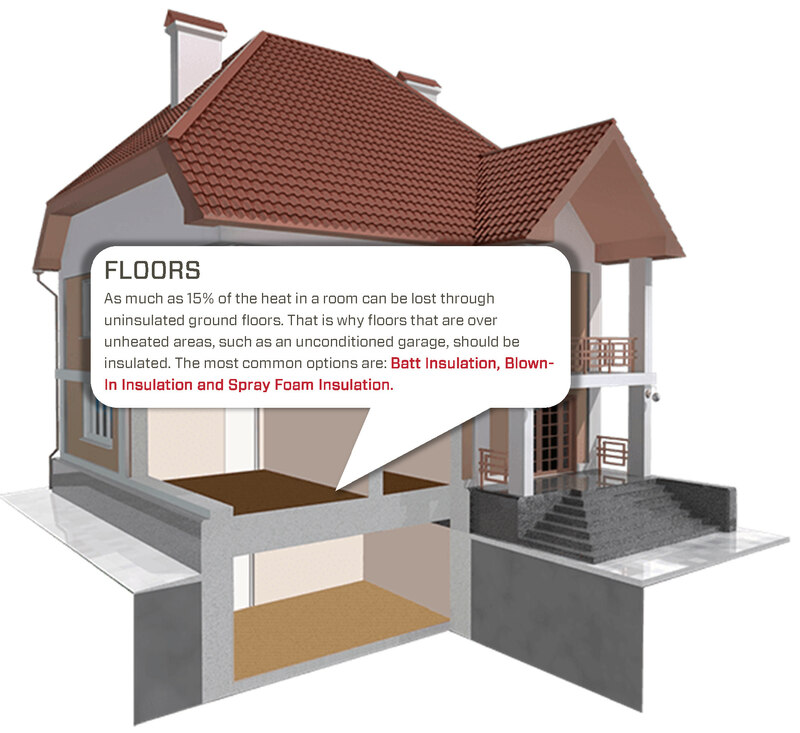 Here is some information about the major types of insulation. 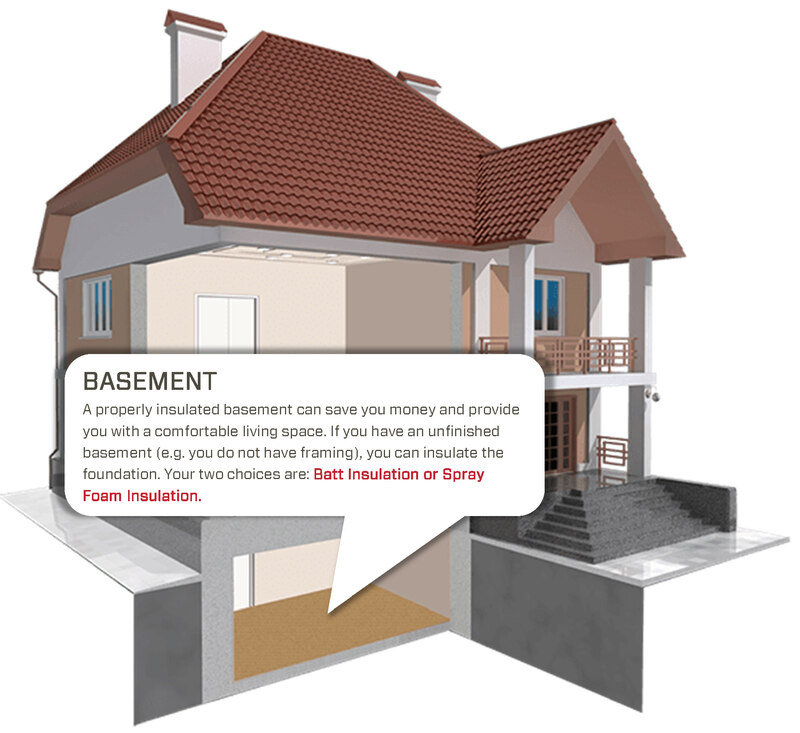 Common and cost-effective, batt insulation provides basic coverage for attics, walls, crawl spaces, ceilings and basements. It’s quick and affordable and also offers sound dampening qualities. With a high percentage of recycled content, blown-in is eco-friendly and very energy efficient. It provides a dense, effective barrier against heat loss in attics, walls and hard-to-reach spaces. 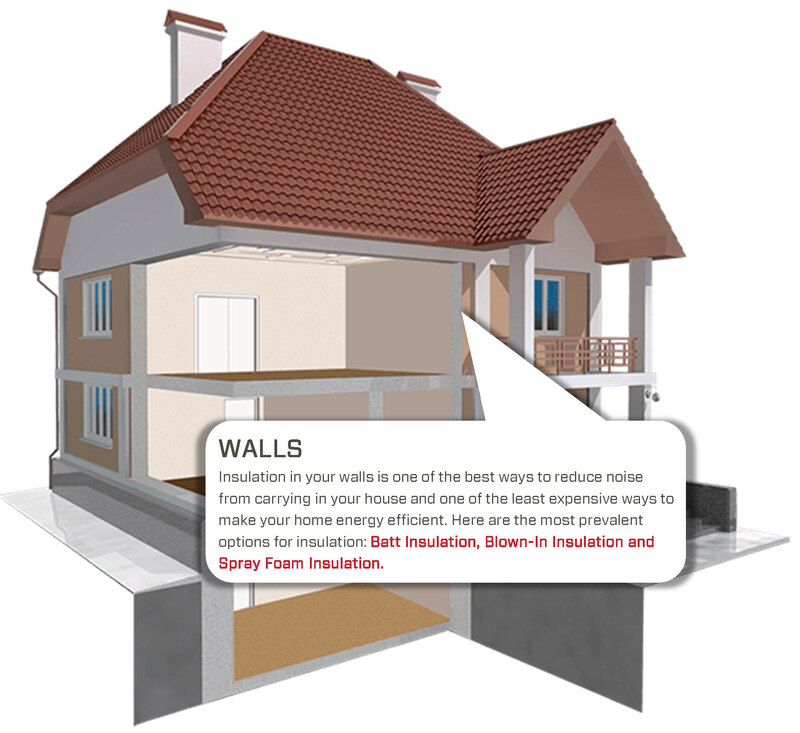 Spray polyurethane foam (SPF) insulation is the most advanced, energy-efficient insulation and air sealant available today. USI offers a nationwide team dedicated to installing this excellent energy-saving technology. CLOSED-CELL SPF provides added structural strength and is a hard, vapor-resistant foam that won’t need to be replaced if your home is flooded. OPEN-CELL SPF offers the same insulation benefits but does not act as a vapor retarder or water barrier. This specialized roof insulation reduces attic temperatures by up to 30 degrees in the Summer. In warmer climates, it reflects and reduces the radiant energy of the sun by 97 percent. All of the cracks, holes and gaps in your home could form the equivalent of a 30-inch-wide window being open at all times. Thorough insulation begins with sealing these hidden holes with proven air sealing techniques. Batt insulation provides good R-Values as well as sound dampening. Up to 80% recycled content is available. Blown-in insulation provides better R-Values and better noise control. Up to 85% recycled content is available, making this an excellent choice for the environment. Spray foam insulation provides the best R-Values while also air sealing tiny cracks and gaps. 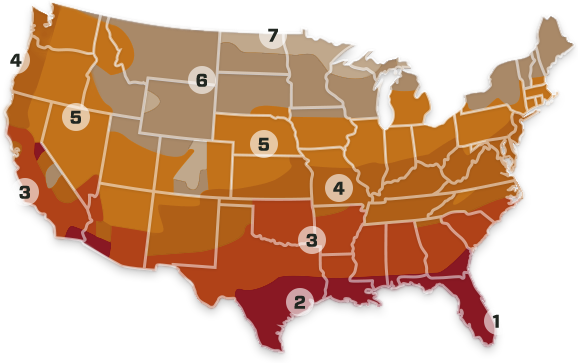 The map below shows the most cost-effective levels of insulation for the different climate zones in the U.S. Based on your zone, use the table to find out how much insulation you need to add if you have an uninsulated attic or if you have a few inches of existing insulation and need more for home restoration purposes. Some types of spray foam, for example, may have a low R-value and yet it is still one of the best insulation types in the industry. The testing that is used to determine the R-value of material is called the “Standard Test Method for Steady-State Thermal Transmission Properties by Means of the Heat Flow Meter Apparatus,” or in short, AST C518. To determine your existing R-Value, you would multiply the inch number of your insulation by the R-Value of its particular type. Below is a chart listing the typical R-Values of the different of insulation type. The below chart features R-Values of particular types of climates. STC Rating 37. Very good at keeping sound pollution out of the building and good for interior sound control. Underside of Roof deck, vertical walls, sound walls. Faced insulation has paper on one side that acts as a Class II vapor retarder installed facing the hot warm side during the winter months. STC Rating 39. Good for interior sound walls but less effective than more against noise pollution. Use in conjunction with other products as a hybrid system. Foam sprayed to the substrate and fiberglass filling the remainder of the cavity. 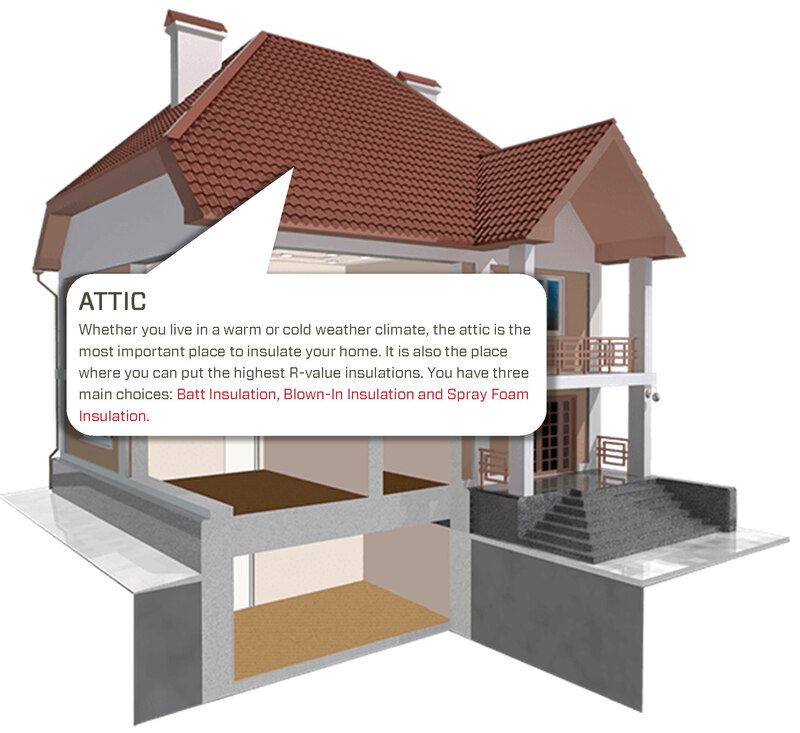 Loose fill insulation is the most economical and widely used insulation in attics at the the attic floor in accessible none sloped areas. Bibs is applied at exterior walls, full filling the cavity and held in place by netting. This application is better than batt insulation filling all gaps around outlets, plumbing and other obstacles. STC Rating 49. Great against noise pollution. 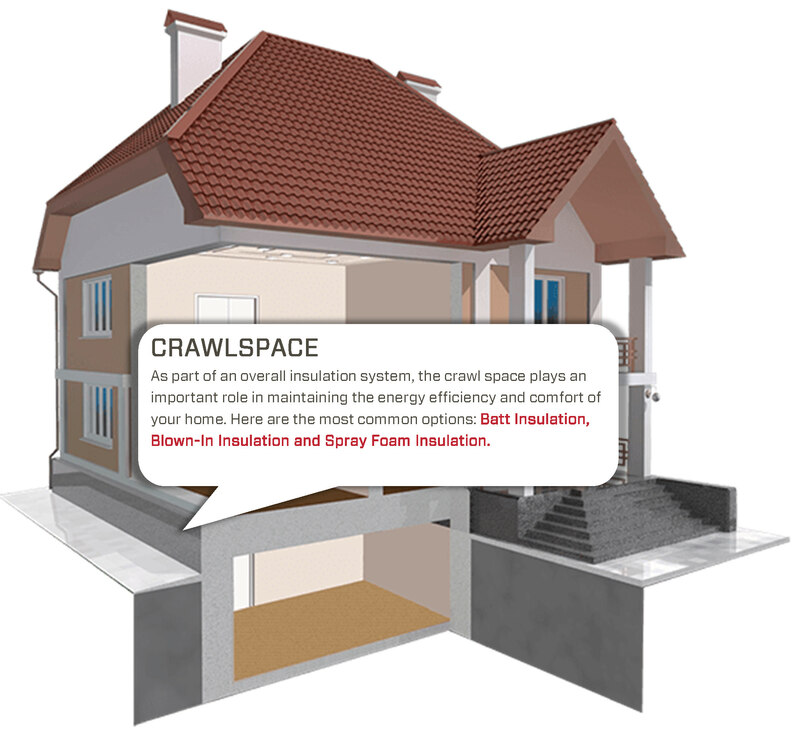 Hire a specialized insulation contractor like USI directly. You can find qualified contractors by visiting websites like your local Home Builders Association, the Insulation Contractors Association of America, the Spray Polyurethane Foam Alliance, or by checking out the listings of qualified contractors on SprayFoam.com. Another option is to hire a contractor through your local home improvement retailer. Hire a general contractor. This is an option when you need to do a complete remodel and need new drywall installed, insulation, flooring, electrical, etc. A general contractor may subcontract the insulation installation to a company like USI. Our local branches are all actively involved in the local Home Builders Association, so our branch personnel will likely be able to point you in the right direction if you need to get a referral. What are the Negatives of Installing Insulation Myself? 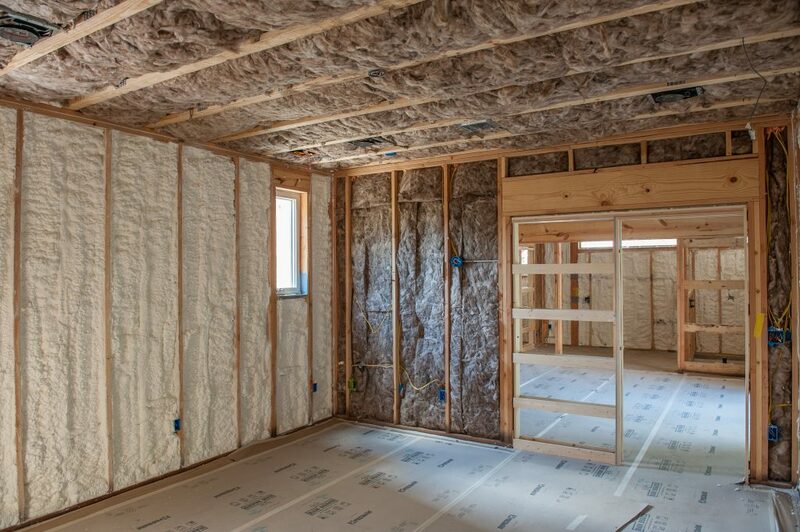 Once armed with a basic understanding of insulation, you’ll need to find the right contractor to complete your installation or home remodel project. Here are some questions to ask. What is your total cost quote for my project, including materials and labor? Quotes for insulation installation can vary widely, so it is important to be clear exactly what is accounted for in the quote. A bid from USI will include materials and labor and will be based on the coverage area. If a contractor charges a fixed rate, ask how they will handle possible additional charges after the contract is signed. If a contractor charges an hourly rate, ask for an estimate on how many hours they expect to be on site. If a contractor charges by coverage area, ask how they determine the coverage area of insulation needed. How long do you estimate my project will take? If you expect an insulation job to be done well, it should not be rushed. However, it is understandable to want the job done as quickly as is reasonably possible. That is why it helps to know how long an insulation project typically takes to complete. A contractor’s estimate should fall logically within that timeframe. Make sure to take into consideration any estimates that may account for different scenarios, like needing to remove old insulation. The size of the project is also a factor. Installing in an attic will be much quicker than installing in an entire home. Below is a general chart of time frames for regular insulation jobs, not taking into account scheduling or availability. Can you provide credible references, referrals, and reviews? Word of mouth is often the most powerful testimony of good work, and it is no wonder. The references, referrals, and reviews of actual customers reveal the strengths of a particular contractor, as well as their weaknesses. Are you familiar with the building codes and requirements for my home? As already eluded to above, this is critical. Building codes are regulations usually set by the city that dictate the standards related to construction, design, alteration, maintenance, and safety. Buildings must conform to these codes and requirements to ensure the health and welfare of residents. It is important that the contractor you hire is familiar with your particular local building codes and needs, and that they fully adhere to them. Are you an active member of reputable associations? When looking to hire a contractor for your insulation needs, active membership in contractor and industry associations is an excellent quality. It shows a commitment to their trade. USI is involved in several industry associations and have been recognized by the Better Business Bureau. For example, here is a live link to USI’s rating on BBB. Click it to review our profile. If there are any complaints in a contractor’s profile, you can read them and see how the company responds and addresses the service quality issue. With USI, an insulation representative may come to your home to identify how much insulation you have and how much you need to add for optimal insulation levels, or it can be done over the phone. A professional assessment and estimate should be free in almost all cases. A contractor representative should help you understand the process of estimating, scheduling and inspecting your insulation project. Expect the installation team to keep you informed during all stages of your project, and to explain how much time to set aside and what may be needed from you. In some cases, you may need to be out of your home to follow safety protocol. For example, there can be breathing hazards during application of certain materials.